Ruby the Hobbit Footpad (2nd level thief, using my S&W Whitebox Rogue/Thief Variant, which translated to OD&D directly). 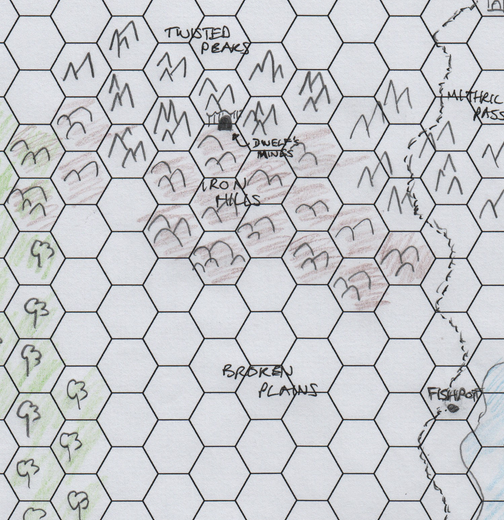 The great thing about this session was that it took me a few hours to prepare – hand-drawn maps and all. I was using a set of house rules for OD&D, which I’ll post when I can get them in a presentable format. As noted in my last post, Ruby found herself under the influence of a Geas, commanded by the Wizard Adrazzias to explore the lost Dwarven Mines of Dwelf Copperhelm, shown on an ancient map as two day’s journey just north of the foothills of the Twisted Peaks. The party decided not to let her go it alone, and set out the next morning north along the well-traveled road to the hamlet of Fishpot, where they geared-up and set out, continuing north for two leagues, then turning west, off the road. While it would have been a faster journey to travel northwest through the Iron Hills, the party decided to be cautious and spend an extra day skirting the hills and staying on the Broken Plains. This proved to be a wise choice, as for two days they traveled the cold, dry landscape and saw neither man nor beast. After an uneventful night, the party headed directly north, this time into the Iron Hills. By the end of the third day they had reached the base of the Twisted Peaks, and set about scouting the area in an effort to find the entrance noted on the map before nightfall. After some searching, Ruby finally found a 3-foot high cave entrance, hidden behind some scrub at the base of a cliff. The party crawled into the cave, and saw that it widened to 15 feet and that the cavern ceiling was well over their heads. They stood and looked around. It was damp, the walls and floor were wet, and running water could be heard from ahead, beyond a narrow stricture. Adrog noted humanoid tracks heading that way from the entrance. Arsenios lit a lantern, and Dai commanded his sword to glow as they proceeded through the narrow gap, into a larger, circular cavern. To their left, the source of the water noise became apparent – a waterfall running down the rock face, floor-to-ceiling. It did not pool, but ran into unseen cracks in the floor. Colors glinted on the rock face under the water. Directly opposite the narrow gap, a five-foot wide tunnel continued out of this cavern, itself about 30 feet across at its widest. Adrog moved across the cavern to stand guard at the exit, while the others went to examine the waterfall. Looking into the waterfall, a mist formed and Arsenios had a vision of men digging their hands into a chest full of gold, while Dai saw a more disturbing vision of Adrog, behind the bars of a portcullis, struggling to free himself. Meanwhile, Adrog reported hearing sounds from beyond the cavern exit – sounds like shuffling feet and rattling of bone on rock. The rest of the party forgot about the disturbing visions for the moment and took positions along the wall, not a moment too soon as six creatures scampered into the cavern. They were each about three feet tall, with tough, leathery, pale grey skin. Their features were grotesque and twisted, with protruding, pointed teeth and long claws. They spotted the party and ran towards them, teeth barred. Ruby took aim with her bow and felled one before it could close the distance, while Arsenios fired a sling stone that flew wide. The five remaining creatures swarmed Adrog and Ruby – two leaping and latching onto Adrog, one on Ruby. The pair struggled to throw them off, even as the creatures’ claws dug into their flesh and drew blood. Adrog managed to hurl one against the cavern wall, smashing its skull, but the other scampered off unhurt, only to attack again. Ruby also managed to dislodge her attacker, but not before suffering a vicious neck wound. Dai, Arsenios and Adrog slew three more creatures in short order, the one remaining, no doubt fearing his imminent demise, turned and ran out the cavern exit. The battle over for now, Arsenios tended to Adrog and Ruby’s wounds, and the party decided they would need to rest, as they had been traveling all day.